Sensible: USES THE EQUIPMENT YOU ALREADY OWN and 100% "Made In The U.S.A.". Secure: international patented mousetrap and keyboard lock for easy transport and storage. 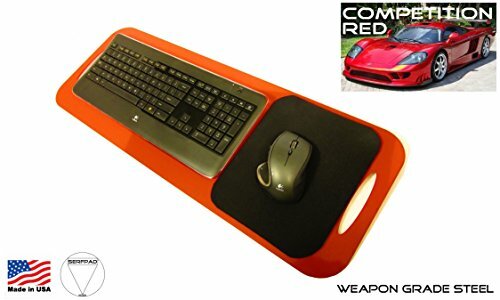 Premium: 8"x10" over-sized mousepad and lapboard specifically built for a laptop or keyboard. Portable: office, couch, bedroom, kitchen, garage, hotel, education, hospital, and boardroom. Practical: #ACCESS. BIGGER. SCREENS. as you SOCIALIZE. STREAM. STEAM. & SHOP. If you have any questions about this product by SERFPAD, contact us by completing and submitting the form below. If you are looking for a specif part number, please include it with your message. Joy Carpets Kid Essentials Infants & Toddlers Jungle Friends Rug, Multicolored, 3'10" x 5'4"